Do you stock the bigger black ink cartridges for the Epson WorkForce Pro WF-7015 printer? This business-friendly multifunction device is an economical choice for small networks at home or in the office. The Epson WorkForce Pro WF-7015 is as versatile as it can be, supporting up to A3+-sized media and promising high speed printing, but it can be difficult to set-up on some operating systems, and wireless set-up is tricky. The Epson WF-7015 printer is engineered to perform efficiently for business tasks, being integrated with the Epson Micro Piezo print heads and DURABrite Ultra ink system. It is Wi-Fi and Ethernet-ready, with Wi-Fi security protocols ranging from WEP-64bit to WPA-PSK (AES). 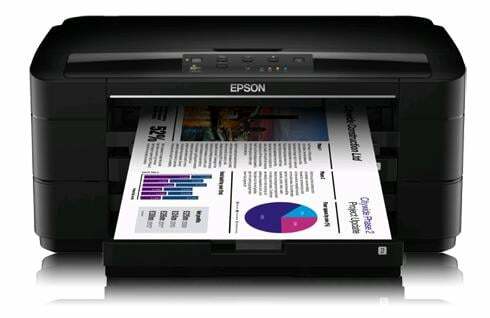 The Epson Workforce Pro WF-7015 is quite large, measuring 558mm wide , 264mm tall, and 414mm deep. Included in its exterior is a minimal control panel for one-touch printer operations. The Workforce Pro WF7015 is Energy Star qualified, has dual paper trays, and an automatic duplex printing feature. Its standard and maximum paper input capacity is up to 500 sheets, and it can easily be integrated into a network via Ethernet or Wi-Fi. When the resolution is optimised, the Epson Workforce Pro WF7015 can print 5760x1440dpi photographs. Although it is network-ready, the Epson WorkForce Pro WF-7015 is tricky to set-up wirelessly. Some helpful features are absent, too, including a USB cable (must be bought separately), USB flash memory support for direct printing, and the necessary network cables. The inks are not exactly high-yield. The Epson Workforce Pro WF-7015 is already heavy even without the power cable and ink cartridges, weighing 12.3kg.